Here is a map displays territory of Japan. map of Tsuruga 1 cm to 1 km displayed. map of Nagahama calibrated free download. free map of Yamamoto 1 cm to 1 km for you. detailed map of Tone 1 cm to 1 km download for free. actual map of Takata 1 cm to 1 km this. detailed map of Suijo и OziExplorer calibration presented. detailed map of Shiotsu-hama calibrated for you. map of Sekigahara with gps calibration free download. 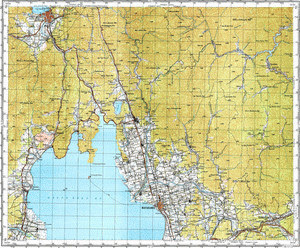 topographic map of Nakanogo download for free. map of Nagaoka calibrated displayed. map of Kinomoto calibrated presented. topographic map of Kawamichi with gps calibration here. detailed map of Kaizu calibrated this. interesting map of Imazu displayed. map of Ibuki with gps calibration for gps. interesting map of Hirose download for free. interesting map of Hirose presented.